It seems like Charice Pempengco ended all the rumors about her gender by posting the picture above. Her new look always burst out controversy especially when she change her look back in 2012 to be more edgy and K-Pop look see the link. 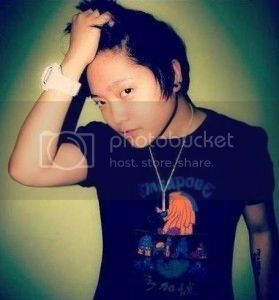 According to batangastoday.com: Charice Pempengco‘s new look for 2013, as shown in the photo above, prompting speculations that she might be a lesbian. And of course to all of these controversies her mother were not happy at all. A Chaster’s fan named Jamie Anne Peters was also dragged in the issue whom is also allegedly girlfriend of Charice, which Mommy Raquel was so furious about. I wonder how will this affect to Charice's career that as of this moment no press release about the issue from her side. Nakita mo na ba ang picture ni Jamie Ann Peters? pabagsakin tong site na to! NOW NA! Aww she looks like a boy here. Is he really lesbian now? She looks like Ariel Pineda!! I have no clue at all who this is! another aiza sequerra? i wonder how this "coming-out-in-the-open" will affect my youngest daughter's adoracion for her. OMG. This is so so so bad. I'm no sexist but seriously, Charice? Hahahahahahha!